Tammy (Melissa McCarthy) is having a bad day. She's totaled her clunker car, gotten fired from her thankless job at a greasy burger joint, and instead of finding comfort at home, finds her husband getting comfortable with the neighbor in her own house. It's time to take her boom box and book it. The bad news is she's broke and without wheels. The worse news is her grandma, Pearl (Susan Sarandon), is her only option—with a car, cash, and an itch to see Niagara Falls. Not exactly the escape Tammy had in mind. But on the road, with Pearl riding shotgun, it may be just what Tammy needs. It must be hard being the actor who plays Mike on 'Mike & Molly.' I mean sure, he's on a successful sitcom and all -- but does anybody actually know that guy's name? Of course not! He's just that dude who is always standing next to Melissa McCarthy. But while poor, poor Mike might be forever stuck in the shadow of his now famous co-star, he does have one slight advantage over his on-screen wife: he didn't have anything to do with 'Tammy.' Dull and surprisingly light on laughs, the flick wastes a strong cast on generic comedy and clichéd drama. You win this round, Mike… or whatever your name is. Tammy is having a really bad day. And by bad day, I of course mean that she runs over a deer, gets fired from her job, and then comes home to discover that her husband is cheating on her. Hoping to escape her troubles, she decides to take a road trip to Niagara Falls with her grandmother Pearl (Susan Sarandon). But a simple change of scenery can't quite fix the poor woman's penchant for misfortune, and soon the duo find themselves in a few tricky situations that put their journey (and our attention spans) in jeopardy. As a character (and a movie), Tammy can sometimes be rather painful to watch. Equally obnoxious and pitiful, she continually wobbles between being annoying and sympathetic, but sadly neither of these qualities result in many successful laughs or drama. 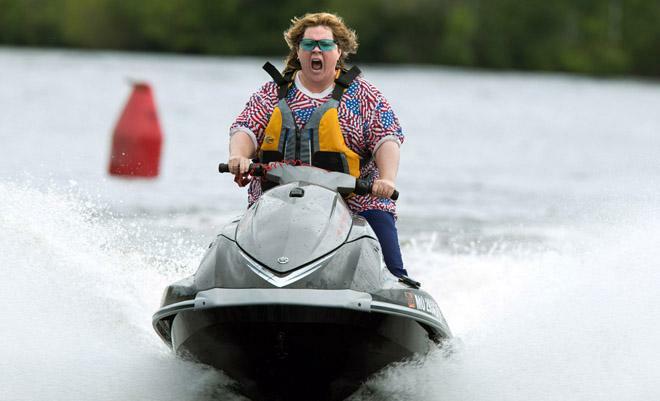 Attempts at comedy usually involve situations like Tammy falling down, Tammy crashing a jet ski, or Tammy having trouble getting food out of a vending machine -- and while McCarthy always seems to be giving it her all, I often felt too bad for the character to actually want to laugh. Likewise, jokes involving her more belligerent behavior have the opposite problem, as she becomes too irritating to be funny. Again, McCarthy clearly tries to milk every situation as much as she can, but these apparent riffs often feel like she's grasping at straws. Even more frustrating, is the fact that the film doesn't actually seem to want to be funny most of the time. With a large emphasis on drama, the movie tries to offer some sweet and emotional insights focused on Tammy and Pearl's bonding experiences, but these frequent heart-to-hearts are very generic and trite. Conflicts also feel forced and far too familiar, leading to an overall character arc that is both predictable and lazy. Tammy gradually mellows out and becomes a more well-rounded person, but this transformation doesn't always come across as natural or believable. She appears to change simply because the writers want her to, not because of what she actually goes through. And sadly, what she does go through is rarely very interesting. Did I mention that she falls down a lot? On the upside, there are a few bright spots here and there. The fast food robbery scene (pretty much completely spoiled in the trailers) is the highlight and is genuinely funny, revealing a sense of comedic timing, direction, and wit that is missing from most of the runtime. The cast is also impressive, with appearances by Kathy Bates, Allison Janney, Gary Cole, Mark Duplass, Nat Faxon, Toni Collette, and Dan Aykroyd. Of course, it would help if any of these talented performers were given something substantial to do. Sarandon is also pretty good as Tammy's lively, alcoholic grandmother, but the chemistry between both actresses isn't as potent as one might hope. Directed by McCarthy's husband, Ben Falcone, and written by the couple, 'Tammy' was seemingly put together with love and care -- which is why its hefty flaws are all the more troubling. To its credit, the film's heart is in the right place, but that doesn't excuse its banal script, uneven tone, and thoroughly basic direction. McCarthy hasn't completely lost all the goodwill she earned from 'Bridesmaids' yet, but with a few more clunkers like this, she might suddenly find herself playing second to fiddle to that guy who plays Mike. Watch your back, McCarthy, Billy Gardell is coming for you! Yeah, I looked him up. 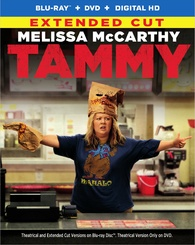 Warner Bros. brings 'Tammy' to Blu-ray on a BD-50 disc that comes housed in a keepcase with a cardboard slipcover. A separate DVD disc and instructions for an UltraViolet digital copy are included as well. After some skippable trailers, the screen transitions to a standard menu. The Blu-ray contains both the theatrical cut and an extended cut that offers about three extra minutes of Tammy (hurray?). The DVD only contains the theatrical edit. The movie is provided with a 1080p/AVC MPEG-4 transfer in the 1.85:1 aspect ratio. Bright and colorful, 'Tammy' looks quite good on Blu-ray. The source is pristine with a light layer of natural grain preserved throughout. Though the cinematography itself is very basic, clarity is impressive, offering pleasing fine details. Contrast can be a little blown out in some scenes, leading to overexposed whites and a somewhat flat look, but most sequences exhibit solid dimension. Colors are punchy without becoming oversaturated. Likewise, blacks are deep and consistent. Thankfully, I detected no digital artifacts or compression issues. Sharp and vivid, the video here gives little to complain about. With no technical issues, this is a strong transfer. The film is presented with an English DTS-HD MA 5.1 mix along with a Spanish and French Dolby Digital 5.1 mix. Optional English SDH, French, and Spanish subtitles are also included. With solid design work, this is a generic but effective track. Dialogue is clear and full-bodied throughout with no balance issues. The soundstage is relatively spacious, spreading general nature ambiance (birds, crickets) and other atmospheric sounds for various locations (bars, restaurants, parties) around the room. Effects work is mostly front-loaded, but the surrounds do chime in when called for, and there is appropriate directionality and panning (a moving car transitions from the front to rear speakers, for instance). Music also comes through with strong separation and range, and there's even some decent bass activity during a few crashes here and there. I don't think anyone will be popping in 'Tammy' to show off their surround sound system anytime soon (or at least, I sure hope they don't), but for a modest comedy, the audio is well done and technically strong. Warner Bros. has provided a small assortment of supplements, including a Blu-ray exclusive featurette and a few deleted scenes. All of the special features are presented in 1080p with Dolby Digital 2.0 audio. Gag Reel (HD, 3 min) – Here we get a typical reel of faintly amusing flubs and bloopers. Despite a talented cast, 'Tammy' is a disposable and forgettable flick through and through. McCarthy can be very funny with the right material -- but this just isn't the right material. The Blu-ray itself features a strong technical presentation and a few mildly amusing supplements. Though I've been pretty hard on the movie, it has a few worthwhile bits here and there. 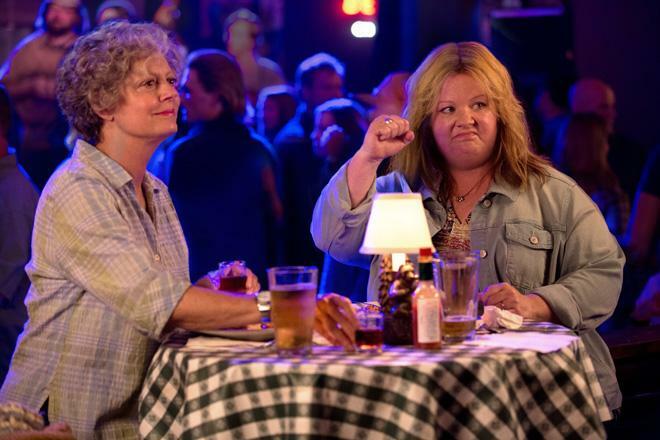 For big Melissa McCarthy fans, this might be worth a rental… just be warned, there's a chance you won't be a big fan anymore by the time the credits roll.